To those of you who, like me, despair when you see a children's menu in a restaurant (denying kids child-sized portions of the delicious stuff the adults are eating), you have a friend in Claudine Pépin. Not one to pamper the children, Claudine's new cookbook, Kids Cook French, with illustrations by her father, the better-known Jacques Pépin, has kids cutting up a whole chicken, making a béchemal sauce, and just generally acting like grownups in the kitchen. In other words, there are no chicken fingers on this kids menu. 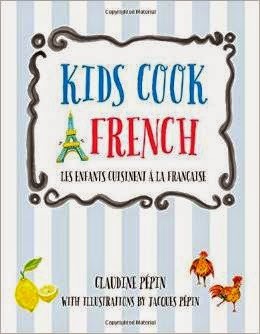 Although I suspect it is adults who will get the most out of this book, especially adults with a yearning for French, for the book is bilingual, with English recipes and text on one page, and the French version the facing page. Which is how I learned that cauliflower is chou-fleur (literally, "cabbage flower"). And unless you have very precocious kids, this may not be, with some exceptions, a cookbook you turn over to your 11-year-old and expect to find dinner and the table when you get home from work. 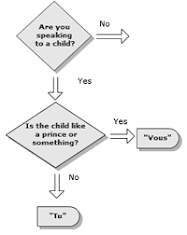 Unless you trust your kids chopping up a whole chicken (with no instruction other than "cut the chicken into eighths") with your 10-inch chef's knife (to be fair, the recipe does say you can buy chicken parts instead) or spending the afternoon on a beef bourguignon. But the best part of kids cooking is cooking with them. And so, do these recipes a couple of times with your kids, and, who knows, you may just be surprised some evening to walk in the door to the smell of poulet à la crème. That is not to say the recipes don't make concessions to youth - there are many, some of which my inner enfant welcomes. I'm looking forward to making a simple soufflé in which you don't separate the eggs (this recipe, like several others, is accompanied by a charming family story about its accidental origin); a croque monsieur that omits the béchemal (although, mysteriously, béchemal is included in a later recipe); and helpful tips for inexperienced cooks of all ages ("If you have the time to wash something you've used while you're cooking, do it!"). Most of the recipes are in fact accessible to a child who likes to be challenged a bit, and Claudine has done a wonderful job of coming up with a well-rounded, appetizing selection of real food, healthy food, and the kind of food our kids should be learning to eat -- and make -- at an early age. The fact is, were it not for the title and the kind of thick cardboard cover you find on picture books, you'd never know you were reading a children's cookbook. And that's a good thing. If youth is wasted on the young, so are a lot of children's books. So you can safely buy this (ostensibly) for your kid, try some good, easy recipes with our without your child, and brush up on your French at the same time. Parents against chicken fingers, unite! Full disclosure: Jacques Pépin graciously provided a blurb for my book, 52 Loaves. I have no other connection with the Pépins.